The national symbols of England are things which are emblematic, representative or otherwise characteristic of England or English culture. Some are established, official symbols; for example, the Royal Arms of England, which has been codified in heraldry. Other symbols may not have official status, for one reason or another, but are likewise recognised at a national or international level. The national flag of England, known as St George's Cross, has been England's national flag since the 13th century. Originally the flag was used by the maritime state the Republic of Genoa. The English monarch paid a tribute to the Doge of Genoa from 1190 onwards, so that English ships could fly the flag as a means of protection when entering the Mediterranean. A red cross acted as a symbol for many Crusaders in the 12th and 13th centuries. It became associated with Saint George, along with countries and cities, which claimed him as their patron saint and used his cross as a banner. Since 1606 the St George's Cross has formed part of the design of the Union Flag, a Pan-British flag designed by King James I. The Royal Banner of England (also known as the Banner of the Royal Arms, the Banner of the King) is the English banner of arms; it features the Royal Arms of England. This Royal Banner differs from England's national flag, St George's Cross, in that it does not represent any particular area or land, but rather symbolises the sovereignty vested in the rulers thereof. 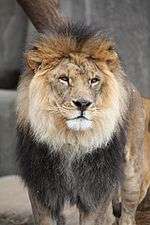 The Barbary lion is a national animal of England. In the Middle Ages, the lions kept in the menagerie at the Tower of London were Barbary lions. English medieval warrior rulers with a reputation for bravery attracted the nickname "the Lion": the most famous example is Richard I of England, known as Richard the Lionheart. Lions are frequently depicted in English heraldry, either as a device on shields themselves, or as supporters. They also appear in sculpture, and sites of national importance, such as Trafalgar Square. The lion is used as a symbol of English sporting teams, such as the England national cricket team. The oak is the national tree of England, representing strength and endurance. The Royal Oak and Oak Apple Day commemorate the escape of King Charles II from the grasps of the parliamentarians after his father's execution; he hid in an oak tree to avoid detection before making it safely into exile. The Major Oak is an 800- to 1000-year-old oak in Sherwood Forest, fabled as the principal hideout of Robin Hood. The rose is England's national flower. Usually red, it is used, for instance, in the emblems of the English Golf Union and England national rugby union team. Fish and chips has been a recognisable cultural and culinary symbol of England since the mid-19th century. A strong contender for the unofficial title of England's national dish, it remains hugely popular as an affordable and nutritious takeaway meal. 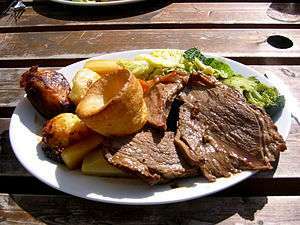 Roast beef and Yorkshire pudding is a widely consumed part of English cuisine, and is symbolic of England. It is another contender for the title of England's national dish. Tea is symbolic of England. 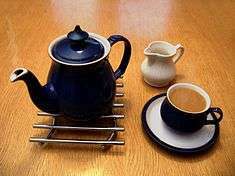 In 2006, a government-sponsored survey confirmed that a cup of tea constituted a national symbol of England. By an alternative view, it may be considered symbolic of Britain rather than England alone for its historical British connection with Empire and India, and is not specifically pre-Union of the Crowns or pre-Union of Parliaments. It is also drunk widely and equally in England, Scotland and Wales. The Royal Arms of England is a coat of arms symbolising England and the English monarchs. Designed in the High Middle Ages, the Royal Arms was subject to significant alteration as the territory, politics and rule of the Kingdom of England shifted throughout the Middle Ages. However, the enduring blazon, or technical description, is "Gules three lions passant guardant in pale Or armed and langued Azure", meaning three horizontally positioned, identical gold lions facing the observer, with blue tongues and claws, on a deep red background. Although officially subsumed into the heraldry of the British Royal Family in 1707, the historic Royal Arms featuring three lions continues to represent England on several coins of the pound sterling, forms the basis of several emblems of English national sports teams (such as the England national football team), and endures as one of the most recognisable national symbols of England. St Edward's Crown was one of the English Crown Jewels and remains one of the senior Crown Jewels of the United Kingdom, often being used as the coronation crown. Since 1952, two-dimensional representations of the crown have been used in coats of arms, badges, and various other insignia to indicate the authority of the monarch throughout the Commonwealth realms. 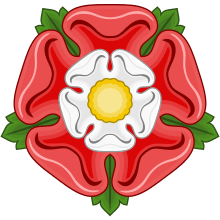 The Tudor rose, which takes its name from the Tudor dynasty, was adopted as a national emblem of England around the time of the Wars of the Roses as a symbol of peace. It is a syncretic symbol in that it merged the white rose of the Yorkists and the red rose of the Lancastrians - cadet branches of the Plantagenets - who went to war over control of the royal house. It is also known as the Rose of England. Geoffrey Chaucer (c. 1342/43-1400): "the first finder of our language", his Middle English collection of 24 stories The Canterbury Tales remains among the greatest poetic works of English literature. Charles Dickens (1812-1870): Generally considered the greatest English novelist of the Victorian era, his numerous works include: A Christmas Carol, Great Expectations, and Oliver Twist. 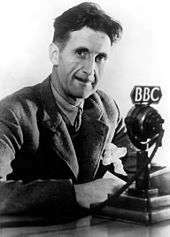 George Orwell (Eric Arthur Blair, 1903-1950): English novelist, essayist, and critic whose politically founded works include the allegorical novella Animal Farm and dystopian novel Nineteen Eighty-Four. William Shakespeare (1564-1616): English poet, dramatist, and actor often called the English national poet and commonly regarded as the greatest dramatist of all time. 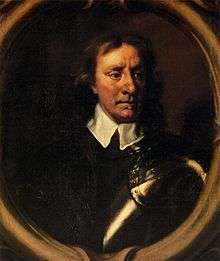 Oliver Cromwell (1599-1658): English soldier and statesman, who raised England's status once more to that of a leading power following a decline after the death of Queen Elizabeth I. A man of outstanding gifts, he believed deeply in religious toleration, and continued to influence political and social ideas until recent times. 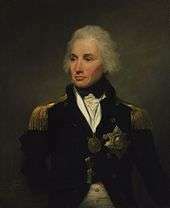 Horatio Nelson (1758-1805): Naval commander whose great success in battle, combined with his humanity as a commander, earned him godlike status in his lifetime. After his death at the Battle of Trafalgar in 1805, he was enshrined in popular myth and iconography. Nelson's column in London's Trafalgar Square was constructed between 1840 and 1843. Arthur Wellesley, 1st Duke of Wellington (1769-1852): Commander of the British Army during the Napoleonic Wars, he first rose to military prominence in India, won successes in the Peninsular War in Spain (1808–14), and triumphed over Napoleon at the Battle of Waterloo (1815); later prime minister (1828–30). Routemaster bus: Double-decker bus designed by London Transport and built by the Associated Equipment Company (AEC) and Park Royal Vehicles; popular with the public, and a perennial favourite with tourists. Rolls-Royce Limited motor cars (1906-1973) and the Spirit of Ecstasy bonnet ornamnet: the original English company established a reputation worldwide for superior engineering quality and all-round elegance, earning widespread recognition for producing the "best car in the world". London taxi / black cab / Hackney carriage: Inimitable and timeless taxi design. Only licensed hackney carriages can pick up passengers on the street and without pre-booking. London's traditional black cabs are specially constructed vehicles designed to conform to the standards set out in the Conditions of Fitness. Traditional London taxi drivers are licensed and must have passed an extensive training course (the Knowledge). The Beatles: Arguably the most significant musical and cultural force of the twentieth century. 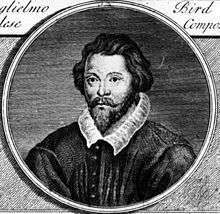 William Byrd (c.1539/40 or 1543 - 1623): So-called "father of English music"; A. L. Rowse says Byrd was to music "what Shakespeare was to the theatre". Edward Elgar (1857-1934): Elgar's status as a symbol of artistic inspiration was celebrated on the English £20 banknote, 1999-2010. 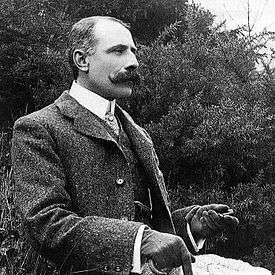 Elgar's numerous compositions include the music of the stirring patriotic song "Land of Hope and Glory". King Arthur: legendary sovereign of the late 5th and early 6th centuries who appears in a cycle of chivalric romances (known as the Matter of Britain). It is not known how his legend originated or whether the figure Arthur was based on a historical person. John Bull: a national personification of the U.K. in general and England in particular, Bull is typically represented in literature and political caricature of the 18th century and after as well-intentioned, frustrated, full of common sense, and entirely of native country stock. 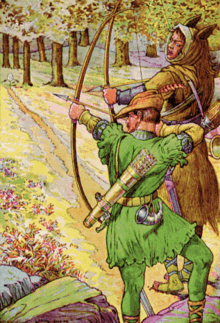 Robin Hood is a heroic outlaw in English folklore. 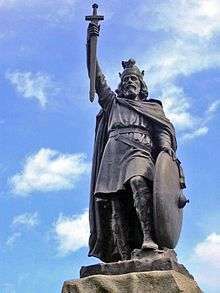 Alfred the Great was King of Wessex, becoming the dominant ruler in England. 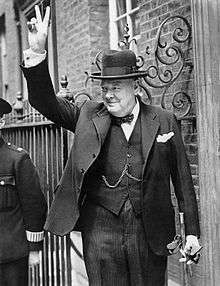 Winston Churchill (1874-1965): voted top of the BBC's 2002 100 Greatest Britons poll, Churchill is among the most influential people in English history. 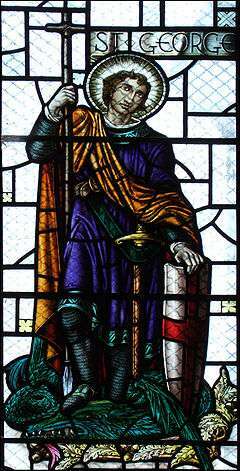 Saint George (280-303 AD): the patron saint of England. Queen Victoria (1819-1901): her reign (1837-1901) is known as the Victorian era; it was a period of great industrial, cultural, political, scientific, and military change, and was marked by a grand expansion of the British Empire. Big Ben is the nickname for the Great Bell of the clock at the north end of the Palace of Westminster in London, and often extended to refer to the clock and the clock tower. The tower is officially known as Elizabeth Tower: it was renamed in 2012 to celebrate the Diamond Jubilee of Elizabeth II. Previously it was known simply as the Clock Tower. "Big Ben" has become one of England's most prominent symbols. Buckingham Palace is the London residence and administrative headquarters of the reigning monarch of the United Kingdom. The palace is often the site of state occasions, and has been a focal point at times of national celebration and mourning. Coldstream Guards: The oldest regiment in the Regular Army in continuous active service, its origin lies in the English Civil War when Oliver Cromwell gave Colonel George Monck permission to form his own regiment as part of the New Model Army. Morris dancing is a form of English folk dance normally accompanied by music. It involves rhythmic stepping and choreographed figures by a group of dancers, usually wearing bell pads on their shins. Morris dancers may use sticks, swords and handkerchiefs when dancing. The earliest known, surviving English record of Morris dancing is dated to 1448. The White Cliffs of Dover: The cliffs have great symbolic value in England because they face Continental Europe across the narrowest section of the English Channel, where invasions have historically threatened and against which the cliffs form a symbolic guard. Before air travel, crossing from Dover was the primary route to the continent, so the cliffs also formed the first or last sight of England for those making the journey. Wikimedia Commons has media related to Symbols of England. 1 2 "St. George – England's Patron Saint". Britannia.com. Retrieved 1 February 2009. 1 2 "United Kingdom – History of the Flag". FlagSpot.net. Retrieved 2009-09-05. ↑ Thompson 2001, p. 91. 1 2 Fox-Davies 2008, p. 607. ↑ Garai, Jana (1973). The Book of Symbols. New York: Simon & Schuster. ISBN 0-671-21773-9. 1 2 3 4 5 6 7 "What images are associated with England?". projectbritain.com. Retrieved 2010-09-22. ↑ "UK: Up a tree with the king to be". The Daily Telegraph. Retrieved 2 September 2016. ↑ Gallagher 2006, p. 19. ↑ "Scotland and the British Empire". History Today. Retrieved 2 September 2016. 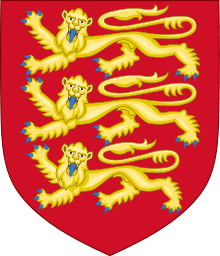 1 2 Boutell 1859, p. 373: "The three golden lions upon a ground of red have certainly continued to be the royal and national arms of England." ↑ The First Foot Guards. "Coat of Arms of King George III". footguards.tripod.com. Retrieved 4 February 2010. ↑ Ingle, Sean (2002-07-18). "Why do England have three lions on their shirts?". The Guardian. UK. Retrieved 2010-09-15. ↑ "Queen at Westminster Abbey to mark her coronation". The Guardian. Retrieved 2 September 2016. ↑ "National flowers". Number10.gov.uk. 2003-01-13. Retrieved 2009-08-08. ↑ Smith, Jed (2005-06-03). "England's Rose – The Official History". Museum of Rugby, Twickenham. RugbyNetwork.net. Retrieved 2009-08-08. ↑ "Geoffrey Chaucer: English writer". Encyclopædia Britannica. Retrieved 2 September 2016. ↑ "Charles Dickens: British novelist". Encyclopædia Britannica. Retrieved 2 September 2016. ↑ "George Orwell: British author". Encyclopædia Britannica. Retrieved 2 September 2016. ↑ "William Shakespeare: English author". Encyclopædia Britannica. Retrieved 2 September 2016. ↑ "Oliver Cromwell: English statesman". Encyclopædia Britannica. Retrieved 2 September 2016. ↑ "Horatio Nelson, Viscount Nelson: British naval commander". Encyclopædia Britannica. Retrieved 2 September 2016. 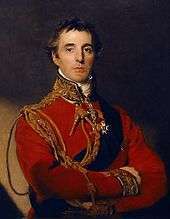 ↑ "Arthur Wellesley, 1st duke of Wellington: Prime minister of Great Britain". Encyclopædia Britannica. Retrieved 2 September 2016. ↑ "Nominate England's greatest icon". BBC News. Retrieved 4 September 2016. ↑ "The Birth of Rolls Royce". History Today. Retrieved 4 September 2016. ↑ "Black Cab tops the list of London's transport 'Design Icons'". Transport for London. Retrieved 4 September 2016. ↑ "100 Greatest Artists". Rolling Stone. Retrieved 4 September 2016. ↑ "The Beatles 'add £82m a year to Liverpool economy'". BBC News. Retrieved 4 September 2016. ↑ ""The Father of English Musick": William Byrd". The Spectator. Retrieved 4 September 2016. ↑ "£20 Elgar note withdrawal 'a national disgrace'". The Daily Telegraph. Retrieved 4 September 2016. ↑ "Sir Edward Elgar: English composer". Encyclopædia Britannica. Retrieved 4 September 2016. ↑ "Arthur: Legendary king of Britain". Encyclopædia Britannica. Retrieved 5 September 2016. ↑ "John Bull: English symbol". Encyclopædia Britannica. Retrieved 5 September 2016. ↑ "Robin Hood: Legendary hero". Encyclopædia Britannica. Retrieved 5 September 2016. ↑ "Victoria: Queen of United Kingdom". Encyclopædia Britannica. Retrieved 5 September 2016. ↑ "Big Ben is a symbol of the grandness of British achievement". Travel Guard. Retrieved 6 September 2016. ↑ "Buckingham Palace: Palace, Westminster, London, United Kingdom". Encyclopædia Britannica. Retrieved 6 September 2016. ↑ "Coldstream Guards". Coldstream Guards. Retrieved 6 September 2016. ↑ "Morris dancers: Why David Cameron is right to support innocent English folklore". The Daily Telegraph. Retrieved 6 September 2016. ↑ "White Cliffs of Dover: Why are they so important to the British?". BBC News. Retrieved 6 September 2016. Boutell, Charles (1859). "The Art Journal London". 5. Virtue: 373–376. Briggs, Geoffrey (1971). Civic and Corporate Heraldry: A Dictionary of Impersonal Arms of England, Wales and N. Ireland. London: Heraldry Today. ISBN 0-900455-21-7. Keightley, Thomas (1834). The crusaders; or, Scenes, events, and characters, from the times of the crusades. 2 (3rd ed.). J. W. Parker.